This is an Aluminium heatsink kit used for cooling various chips such as on the Raspberry Pi. You can attach the heatsink with the thermal conductive adhesive tape provided on each heatsink. 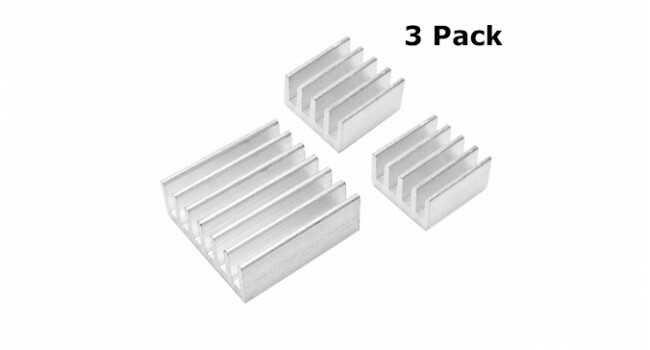 The combo pack includes 2 small heatsinks and 1 large heatsink. 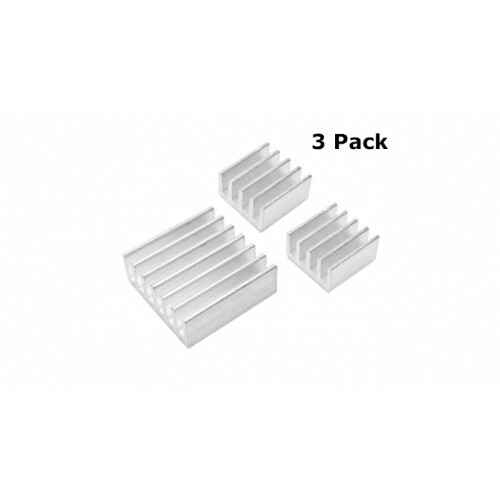 Heatsink TO220 (Pack of 4) Specifictions Package Type : TO-220 Family : Thermal Heat Sinks Attachment Method : Bolt On Shape : Rectangular Length : 19.05mm Width : 19..
Heatsink 10x10x10mm ( Pack of 4)Heatsink for 10x10mm BGA-chips. Can be mounted easily with adhesive heat conducting film (Not provided ).Quick SpecsDimensions: 10 x 10 x 10mm..
Heatsink 9x9x4mm (4 Pack) Heatsink for 14x14mm BGA-chips. Fits the Raspberry Pi CPU. Can be mounted easily with adhesive heat conducting film (Provided with chips). Quick Spec Materials: Al..
Rubber Feet Push-in (8 Pack) These little soft rubber feet with push in mounts are the perfect size to add to your project. They are made from industrial rubber and feature a self-locking mechanism..
Stepper motor nema 14, 1.8 Deg , 0.8A This hybrid bipolar stepping motor has a 1.8° step angle (200 steps/revolution). Each phase draws 400 mA at 10 V, allowing for a holding torque of 1 kg-cm (14 o..